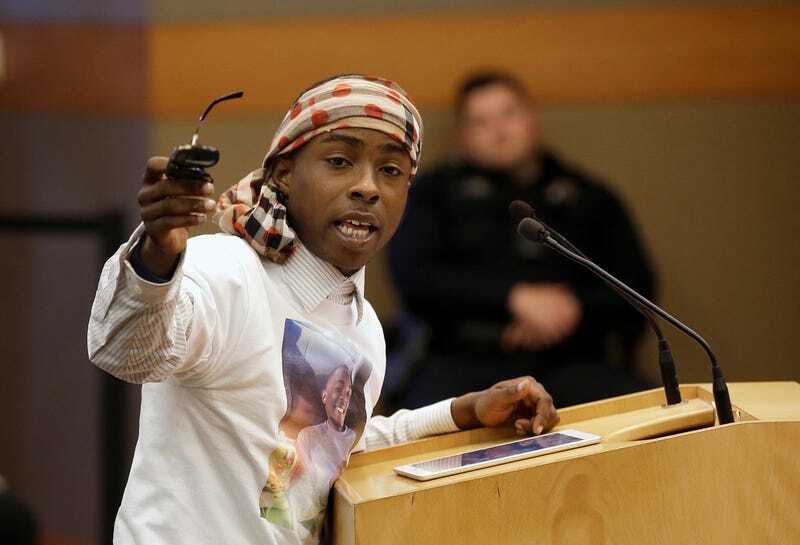 Stevante Clark, the brother of Stephon Clark, who was shot and killed by Sacramento, Calif., police, speaks before a meeting of the Sacramento City Council on April 10, 2018. Stevante Clark, the older brother of Stephon Clark, the unarmed man shot and killed by Sacramento, Calif., police, was arrested in that city Thursday on charges of suspicion of assault with a deadly weapon and making death threats. The older Clark brother, 25, was taken into police custody around 10 a.m. and is currently ineligible for bail, the Sacramento Bee reports. According to the report, Clark’s roommates—a couple with whom he shares a residence in North Sacramento—said the arrest came after days of increasing conflict between both parties. On Wednesday, the woman sought an order against Clark after the couple said he made threats against her. That restraining order was granted. Besides charges of assault and making threats, Clark was also being held on suspicion of vandalism and making harassing 911 calls. Clark had been receiving inpatient mental health treatment earlier this month after police responded to a 911 call about a disturbance. Clark himself has said that he has had difficulty coping with his brother’s death, even as the case is under such public scrutiny, the Bee notes. “At this point, it’s a processing of his grief as well as continued mental health issues that he’s not addressing,” Sonia Lewis, a relative of Clark’s and member of Black Lives Matter Sacramento, told the news site. She said she did not know what exactly led to Clark’s arrest, but expressed concern that he was put in jail instead of being given mental health treatment. Meanwhile, as Clark deals with the aftermath of his brother’s shooting death, the two officers who were involved in the shooting are back to business as usual and on duty, the New York Daily News reports. The two officers, who claimed to have somehow thought Stephon Clark had a gun on him even though he only had his cellphone, have still not been formally identified. The officers had been placed on administrative duty, as is typical in these types of cases; however, on Thursday, the Sacramento Police Department told local news outlets that they were back on the job, though not on patrol duty ... so I suppose that’s something? It was still not immediately clear what the officers’ duties are or if they will remain on active duty, the Daily News notes. This decision comes after the release of several police videos detailing what happened the night Stephon Clark was shot and killed. Those videos showed that officers believed that Clark was playing dead even after police fired 20 rounds at the young father, and showed that officers waited almost five minutes before giving him medical attention.